Nine days before Virginia’s new laws take effect, Gov. 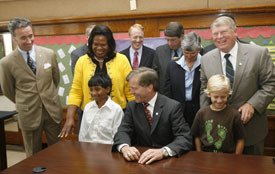 Bob McDonnell today ceremonially signed legislation that will facilitate the expansion of charter schools in the Commonwealth. The legislation, HB1390, sponsored by Del. Scott Lingamfelter, R-Woodbridge, and SB737, sponsored by Sen. Steve Newman, R-Lynchburg, was part of the governor’s 2010 Opportunity to Learn education reform legislative agenda. McDonnell was joined at today’s event by Del. Lingamfelter and Del. Rosalyn Dance, D-Petersburg, who was a chief-co-patron of the House measure. Virginia Secretary of Education Gerard Robinson, Virginia Superintendent of Public Instruction Pat Wright, members of the General Assembly and other education leaders also attended today’s ceremony. The bill signing took place at Patrick Henry School of Sciences and Arts, a charter school scheduled to open in Richmond this fall. The legislation signed today significantly improves the application and review process for public charter school applicants. It requires the public charter school applicant to submit its proposed charter application to the Board of Education for review, comment and a recommendation for approval or disapproval prior to the submission of the application to the local school board. This will help expedite meritorious applications and provide uniform statewide input to get good applications approved. The bill also allows for a public charter school applicant whose application was denied, or a grantee whose charter was revoked or failed to renew, to receive written reasons for such denial and thereafter petition the local school board for reconsideration. The process for reconsideration will include an opportunity for public comment and technical assistance from the state Department of Education. The final decision still rests with the local school board.